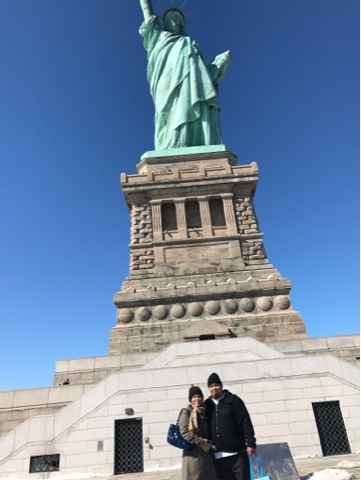 Another big landmark we wanted to see during our time in New York was the Statue of Liberty. We didn't want to just pass by it on a ferry ride, we wanted to be able to get off the boat, walk around and go inside. 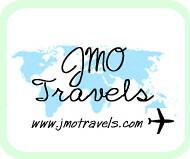 Before we set off for New York, we got online and did our research. To go to the Statue of Liberty and to be able to walk around, you need a ticket from the National Park. When going inside there are two different types of tickets- The Crown or the Pedestal. We chose to do the Pedestal which takes you to the bottom of Lady Liberty's sandaled feet. The ferry ride over provides you with some amazing views of the city. Once you begin to get further from the city, Lady Liberty comes into view. The ferry boat actually passes it to park on the far side so you get to see if from all the angles. 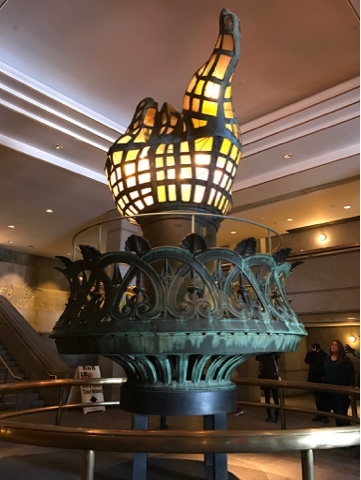 Once you get off the boat and enter the base of the Statue you go through an area that houses the original torch which was on display until the remodel. You have two options on how to get into the pedestal. You can either take the stairs or an elevator and then one flight of stairs. We chose the elevator because we had already walked a lot that day. Once you get to the pedestal entrance you must go outside to see the grounds and the view of the statue from that vantage point. At the pedestal, this is where you would begin the climb to the crown if you chose to do that. We chose not to because it's 200 vertical round steps which you can see the way down. For my husband that's a challenge because he doesn't do well with heights. 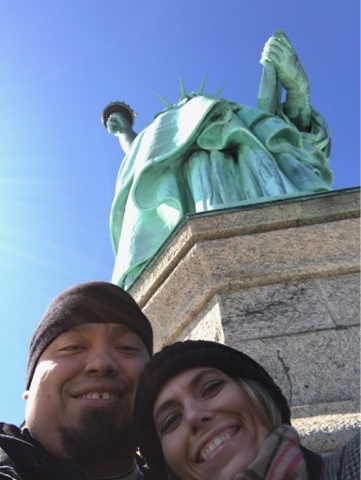 We really enjoyed visiting Lady Liberty for a few hours and had a great time. The ferry ride was freezing and the line to get on the ferry to get over to the island was a little crazy but we had a great time!